Never Worry About Making a Mortgage Payment Again. Or Your Neighbors Ever Speaking To You Again. 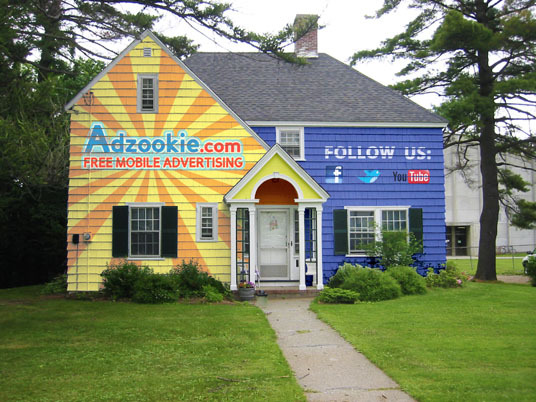 Mobile ad network AdZookie plans to turn houses into gigantic billboards by painting a brand’s message on them. As payment to the homeowner, AdZookie will pay the homeowner’s mortgage each month for as long as the house remains painted with the message. Here are a few things they’re looking for. You must own your home. It cannot be rented or leased. They’ll paint the entire outside of the house, minus the roof, the windows and any awnings. Painting will take approximately 3 – 5 days. Your house must remain painted for at least three months and may be extended up to a year. If, for any reason, you decide to cancel after three months or if AdZookie cancels the agreement with you, they’ll repaint your house back to the original colors. Little pink Pepto Bismol houses for you and me.